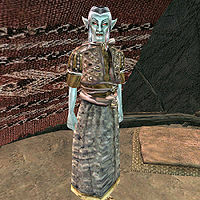 Tussi, a Dunmer healer, is a Brother in the Zainab Ashlanders. Tussi can be found in her yurt at the Zainab Camp in the Grazelands region. She wears a common shirt with matching skirt, pants, and shoes. Aside from her natural resistance to fire and the sanctuary provided by her ancestors, she knows the following spells: Burden of Sin, Crushing Burden, Cruel Weary, Dire Weary, Great Feather, Second Barrier, Strong Reflect, Strong Spelldrinker, Wild Spelldrinker, Blood Gift, Powerwell, Vivec's Mercy, Poet's Whim, and Slowfall. Tussi lives and works in her yurt. Upon entering, you'll find a table on your left, and while it only has clutter on top, beneath it sits a locked chest holding an assortment of healing potions. She keeps her bedroll near the table. Baskets, sacks, and urns line the walls of her yurt, containing various random ingredients and food, but not much else of note. In the center of the yurt is her fire pit. As a member of the Zainab Tribe, killing her will anger the tribe and prevent you from completing the Zainab Nerevarine quest, a required part of the Main Quest. This page was last modified on 10 March 2019, at 18:53.